Ablation, as it pertains to your vascular (circulatory) system, is a process of getting rid of a problematic blood vessel. This can be achieved in different ways, including traditional options like surgery to strip a vein, or by using the latest technological advances in an outpatient environment. Many patients prefer the latter for its ease and lack of downtime afterward. Venous ablation may be used to treat chronic venous insufficiency and varicose veins, among other vascular conditions. This minimally invasive, image-guided procedure is used to seal off a vein using heat delivered by laser technology. 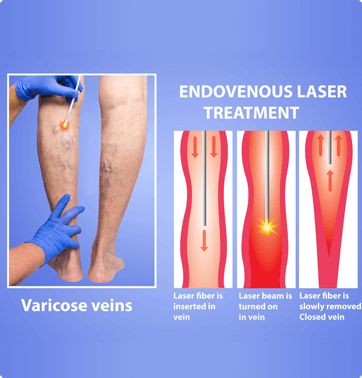 EVLA cauterizes and closes a vein in the leg, for example, as can occur when the valves of a vein fail to prevent blood from backing up and pooling in the leg (venous reflux). In the procedure, a laser fiber needle is inserted into the vein via a small nick in the skin – so small that stitches are not needed to close it after the procedure. Laser energy is delivered to the site, which effectively seals the vein shut. Ultimately, the closed vein is reabsorbed into the body. A similar procedure may also be performed using radiofrequency energy. Like endovascular laser ablation (EVLA), radiofrequency ablation (RFA) is a type of thermal ablation, where heat – in this case, delivered via an electrical current caused by radio waves – is used to seal off a troublesome vein. In this procedure, a catheter is inserted into the target vein, and radiofrequency energy is delivered to the vein wall to cauterize and close the vein. The vein actually begins to close during the procedure. The VenaSeal™ Closure System is another image-guided, minimally invasive procedure to close a vein and re-route the blood through other more healthy veins. However, this method doesn’t use thermal energy to close the vein. It uses a liquid medical adhesive (special glue), which is delivered via catheter into the target vein. This procedure may be recommended to treat the small saphenous vein because heat-based procedures pose a risk for nerve injuries when treating this vein. If you’re experiencing venous reflux, varicose veins, or symptoms of peripheral artery disease, call Premier Vein & Vascular at 1-888-VEINCARE to find out if one of our ablation services may be right for you, or you can use our convenient online form to request an appointment. We look forward to seeing you at one of our two locations in Tampa and Largo, Florida.